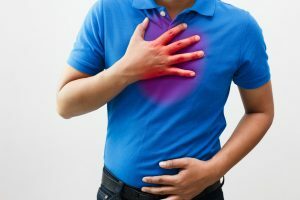 Could Heartburn Meds Lessen Life Years? It may be like second nature popping a heartburn medicine at the first sign of acid reflux. However, what may seem like a habit could be shaving years off of your life. A recent study has found that long-term use of heartburn medications could lessen life years. Gastroesophageal reflux, or acid reflux, occurs when your stomach contents come back through your esophagus. Furthermore, heartburn occurs when acid from your stomach lining comes back through the esophagus. GERD, or gastroesophageal reflux, is when acid reflux occurs for twice a week for more than a few weeks. Uncontrolled GERD can lead to respiratory problems or conditions such as esophagitis, which is an inflammation of the esophagus. A recent study in the British Medical Journal Open looked at the medical records of thousands of people who use proton pump inhibitors (PPI). PPI’s include such medications like Nexium, Prilosec, or Prevacid. The study found that those who used the drugs for more than a year had a 51-percent increased risk of premature death as compared to those who did not take them. Short-term use of 90 days or less did not reveal any health risk. PPI’s work by blocking the system that produces stomach acid. In turn, long term use of such medicines can increase risk of kidney disease, heart disease, pneumonia, bone fractures and dementia. This is not to say that such medicines are not useful. PPI’s can aid people with acid reflux. However, use of this medicine should be supervised by a healthcare professional. In addition, use of such medicines should not be used longer than truly needed for treatment of acid reflux. Eating smaller meals throughout the day versus larger meals. A lot of pressure can be placed on the stomach when eating a lot of food at one sitting. This can cause food particles to be pushed back up through the esophagus. This can throw acid from the stomach into your esophagus, thus causing heartburn. Therefore, eat more frequent, smaller meals throughout the day to allow time for your body to fully digest your food, and to prevent any stomach acid from causing discomfort. Wear looser clothes. Wearing tight fitting clothes can place pressure on your digestive system, which can increase risk of acid reflux. Therefore, if last year’s jeans are feeling a bit snug, stop by the store to invest in a looser pair. Exercise more often. Staying active can help improve digestion and can also lead to better weight management, which both can assist in preventing acid reflux. Therefore, find ways to get your steps in everyday. Walking, water aerobics, biking, or gardening are just a few ways to stay active. Every movement is one step closer to improved health. Start taking a probiotic such as Biovia 30 by Vita Sciences. Biovia 30 contains a blend of probiotic strains that help to support improved digestive health. This particular probiotic helps to build good bacteria and rid of bad bacteria that may be wreaking havoc on your digestive system.